» Review: Osprey Exos 48 – Ultralight, but is it Useful Enough? Review: Osprey Exos 48 – Ultralight, but is it Useful Enough? Ultralight and lightweight backpacking is becoming quite popular throughout the world. The advantages of downsizing to a lighter load are numerous with the primary benefit being as simple as not having to carry so many pounds on your back. Going with an ultralight or lightweight load means you can often hike longer and maintain a faster pace, with increased stamina and endurance. Although some of the big brands have gear lines directed at this demographic of backpackers, many of them still fall short. Either they weigh too much, the bags are far too thin and thus easily damaged, or they lack a lot of features traditional backpacks have. Thankfully Osprey, a company well-known for their backpacks, stepped in and created their Exos line. 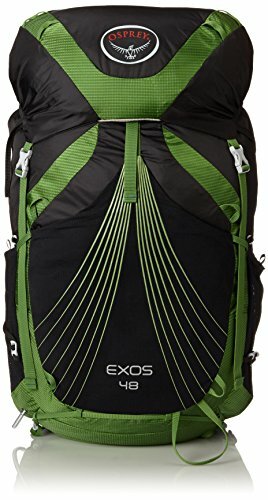 The Osprey Exos line consists of 3 different bags in 58, 48 and 38 liter capacities. 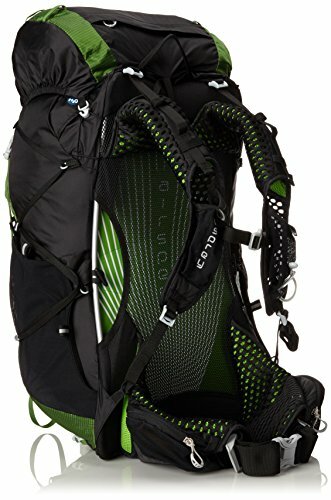 Osprey has these bags listed as an ultralight pack suitable for Appalachian Trail, thru-hiking and long trail backpacking. All three backpacks are virtually identical save for the gear capacity, but the Exos 48 is the perfect midrange model for the average UL backpacker. Who is the Exos 48 Best For? If you are a gear junkie or someone that really enjoys a beautiful yet functional design, the Exos 48 is going to really impress you. 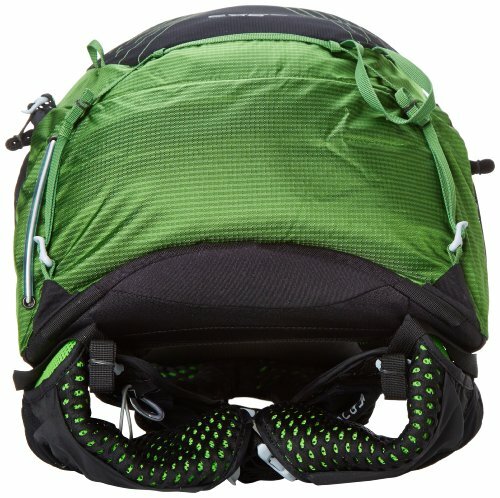 As usual, Osprey nailed their goal of creating a backpack that has enough features to really give you a great backpacking experience while excluding unnecessary items that would only have added weight. Available in 2 colors, Basalt Black (green & black) and Pacific Blue (blue & white). The Exos 48 suspension system is Osprey’s Airspeed which includes ultralight and durable aluminum framing and a 3D back panel made of a tensioned mesh which gives the wearer side ventilation. Shoulder straps are made of ExoForm technology, consisting of flexible mesh encapsulated dense gel along with a quick adjustable sternum strap. There is a built in whistle on the sternum strap for safety. Exoform technology also present on the hip belt which gives a custom, ergonomic fit. The hip belt is seamless to prevent chafing and has a cinch closure which is pulled forward to adjust, making it easy to tighten or loosen the belt while on the trail. Top of the backpack is Osprey’s FlapJacket lid which serves as weather protection for the main compartment as well as additional storage. The lid is completely compressible and may be completely removed. Lid has zipper closure on top and under for easy access. Exos 48 is compatible with internal hydration reservoirs. Behind the back panel there is a space to insert a reservoir that will keep it protected from the rest of the gear in the main compartment. Reservoirs are sold separately by Osprey but you may use a different brand. Side of the backpack has webbed compression straps for cinching down your bag to a compact size. Strap set up allows you to cinch down over or under the side pockets. Other straps on the backpack include tool and sleeping pad attachments. Aside from web straps there are also bungee-style straps and strong cord loops for additional storage of outerwear and gear. Numerous pockets both inside and outside of the backpack to keep your gear organized. The pockets on the front and side of the pack are made from a strong woven mesh that are stretchy enough to securely hold water bottles, gloves, even a lightweight shell-style rain jacket. The hip belt also has a zippered pocket which is perfect for storing your cellphone, GPS, maps and snacks. While not a physical feature, another benefit of the Exos 48 is Osprey’s guarantees on their gear. If for any reason you decide you no longer want your backpack you can send it back for a refund or replacement. You will find that the Exos 48 has been thoroughly tested by many people and has a 5 star rating on the Osprey website as well as throughout numerous retailer websites. This backpack is a truly awesome product that has nearly anything a backpacker could wish for. There are a lot of advantages of the Exos 48 but there are 3 major strengths of this model. When it comes to ultralight backpacking, the fit of a backpack is particularly important. Even though you are carrying lighter weight it doesn’t mean you can skimp on the fit of your pack. The ExoForm technology used in the hip belt and suspension system ensures that the backpack melds to fit your individual anatomy. Additionally, despite the backpack being unisex, this natural ergonomic, self-customizing fit from the gel and foam means both genders can wear it comfortably. A huge benefit of the Exos 48 is how many storage options are on and in the bag. Just because you may carry less gear doesn’t mean staying organized isn’t important. If anything, it’s more important because you may have downsides items such as your cooking kit which could get lost within the main compartment. The various pockets and straps make this backpack super user-friendly while on the trail as well since you can access water, snacks and the top lid without removing the bag. Bad weather, primarily wet weather, can ruin a backpacking trip if you aren’t prepared. Since weight is so crucial Osprey used only high quality Nylon that is fairly water resistant in light rain. There is also a built in rain cover for the backpack which is included in the total weights listed in the specs section. There aren’t any obvious downsides or weaknesses of the Exos 48 but some people may wish there are gender-specific models to allow for differences in anatomy or more color options. Overall Osprey really created an amazing backpack that is suitable for all lightweight backpacking activities up to ultralight trips. The Exos 48 is ideal for any person who is interested in ultralight and light backpacking regardless of experience. Depending upon your experience with this method of backpacking, this pack is large enough for long weekend trips possibly up to a week based on your usual gear load. For the beginner you will easily be able to use this bag for weekend trips. 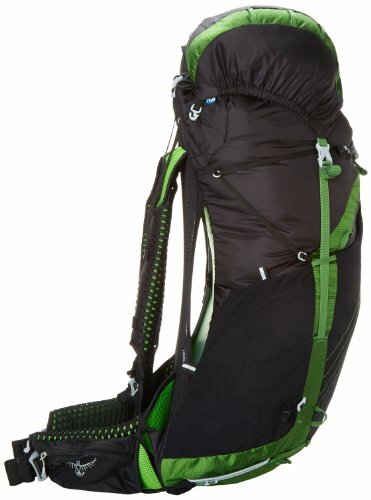 Osprey recommends this bag maximum weight stays under 30lbs so even if you are new to UL backpacking, you could start using the Exos 48 immediately even if you haven’t started downsizing your gear yet. You can check this listing for the latest pricing.